The advent of high-resolution computed tomography (CT) scanning in the 1980s revolutionized diagnostic imaging of the temporal bone. CT scanning offers the greatest structural definition of any currently available imaging modality. [1, 2] The purpose of this article is to familiarize the reader with the normal anatomy of the temporal bone depicted by CT scanning. 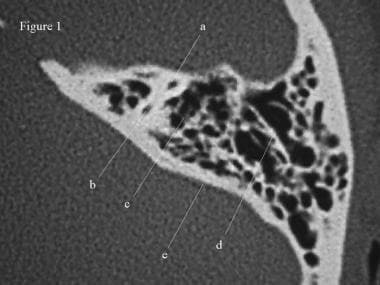 The article reviews the anatomy of the middle ear space and surrounding bone and presents radiographic imaging in both axial and coronal views, with labeled salient features and relevant text. CT scan, temporal bone. An axial view through the superior portion of the temporal bone, which demonstrates the anterior (a) and posterior (b) crura of the superior semicircular canal. The surrounding otic capsule is observed as dense white bone. The mastoid air cells (c) are lateral to the otic capsule. The squamous air cells are separated from the petrous air cells by the Koerner septum (d). The posterior margin of the temporal bone, or cerebellar plate, (e) forms the anterior margin of the posterior cranial fossa. The temporal bone houses and is surrounded by many vital structures. The temporal bone is actually composed of four bones, consisting of the squamous, petrous, tympanic, and mastoid segments. The bony framework of the temporal bone contains multiple air spaces. The most complex of these spaces is the middle ear cavity, or tympanum. The middle ear space is shaped somewhat in the form of a red blood cell stood on end. This space is narrow in a medial-lateral direction and more elongated anteroposteriorly and superoinferiorly. Laterally, the tympanic membrane, annulus, and the handle of the malleus make up the wall of the tympanum. The inner ear forms the medial wall of the middle ear. The largest anatomic structure of the medial wall is the promontory of the cochlea. The roof of the middle ear space is formed by the tegmen tympani. This structure separates the middle ear space from the middle cranial fossa. The tegmen slopes inferiorly as it courses laterally along the temporal bone; remember this point during mastoidectomy to avoid violating the tegmen with the drill. 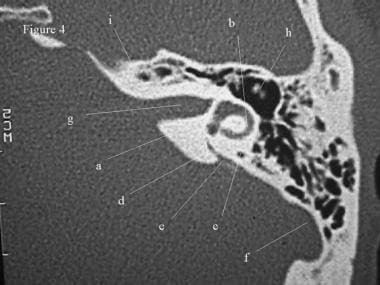 In addition, the tegmen is located higher than the superior border of the tympanic membrane, forming a space, the epitympanum. The epitympanum houses the head of the malleus and the body and short process of the incus. The floor of the middle ear is primarily composed of the bone covering the jugular bulb. The bone over the bulb may be dehiscent, rendering it more susceptible to injury. The floor of the middle ear cavity is located further inferiorly than the lowest extent of the tympanic membrane, creating a space, the hypotympanum. Anteriorly and inferiorly, the carotid artery limits the tympanum. 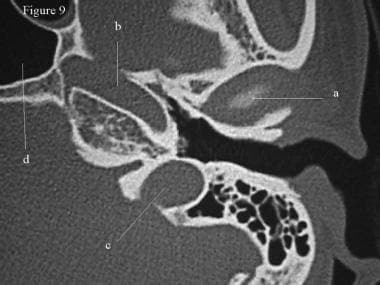 More superiorly, the eustachian tube, tensor tympani, and cochleariform process can be observed along the anterior margin of the middle ear. The mastoid air cells lie immediately posterior to the middle ear space. The entrance to the mastoid air cells is the aditus ad antrum. The pyramidal eminence (giving rise to the stapedius tendon) and the incudal fossa can also be observed immediately posterior to the middle ear space. The middle ear space contains several spaces of clinical significance. The sinus tympani is located between the labyrinthine wall and the pyramidal eminence. This area is a common site for recurrence of cholesteatoma. The facial recess is found between the tympanic annulus and pyramidal eminence. This recess provides improved access to the middle ear space during a tympanomastoidectomy. The inner ear is housed in the bony labyrinth, which is well demonstrated on CT scans. The cochlea lies anteriorly. The cochlea is a conical structure, with its apex pointed anteriorly, inferiorly, and laterally; its base rests near the internal auditory canal and extends outward for 2.5-2.75 turns. Immediately anterior to the cochlea is the carotid artery. The round window is located in the scala tympani of the basal turn of the cochlea. The round window niche houses the round window. This window is the termination of the scala tympani of the cochlea. The niche protects the round window from direct exposure to sound waves in the event of a tympanic membrane perforation. The vestibule lies posterior to the cochlea, abutting the internal auditory canal medially. The stapes footplate transmits vibrations to the vestibule at the oval window. The 3 semicircular canals emanate from the vestibule. The lateral canal lies 30° from horizontal. The 3 canals lie at right angles to each other. The endolymphatic sac is posteromedial to the semicircular canals on the posterior margin of the petrous bone. The seventh and eighth cranial nerves (CN VII and CN VIII) course through the internal auditory canal. CN VIII enters the structures of the inner ear to innervate them and CN VII passes laterally and anteriorly to the geniculate ganglion, then posteriorly along the medial wall of the tympanum before heading inferiorly to the stylomastoid foramen. The images of the temporal bone are examined in 2 planes, axial and coronal, because both views are crucial to an adequate study. The images below are axial sections through a left temporal bone. The images are ordered from the most superior (the first image) to the most inferior (the ninth image). CT scan, temporal bone. The anterior limb of the superior semicircular canal can be observed (a). Posteriorly, the posterior limb of the superior semicircular canal forms the crus commune (b) by joining with the posterior semicircular canal (c). The mastoid air cells (d) and cerebellar plate again are visible. CT scan, temporal bone. The sigmoid sinus indents the cerebellar plate posteriorly (a). More inferiorly, the sigmoid sinus forms the origin of the internal jugular vein inferiorly. The vestibular aqueduct (b) courses posterior to the posterior semicircular canal (c) and the more anteriorly located superior semicircular canal (d). The superior aspect of the lateral semicircular canal (e) is located lateral to the other semicircular canals. The most superior portion of the internal auditory canal (f), carrying the facial, cochlear, and superior and inferior vestibular nerves, is the lucency in the medial of the petrous bone. CT scan, temporal bone. An axial section through the vestibule (a) and lateral semicircular canal (b). The posterior semicircular canal (c) and vestibular aqueduct (d) still are visible posteriorly. The vestibular aqueduct is passing from the endolymphatic sac (e), which indents the posterior margin of the petrous bone, towards the vestibule. Posteriorly and laterally, the sigmoid sinus (f) is visible, and medially, the internal auditory canal (g) is the indentation on the medial border of the petrous bone. 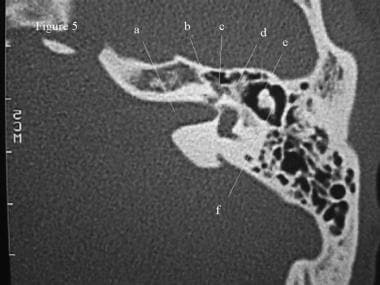 Note the middle ear space superior to the uppermost aspect of the tympanic membrane, the epitympanum, which houses the head of the malleus, as well as the body and short process of the incus (h). The petrous apex is visible (i). CT scan, temporal bone. The facial nerve can be observed coursing from the internal auditory canal (a). From here, the facial nerve turns anteriorly as the labyrinthine segment (b). This segment ends at the geniculate ganglion anteriorly (c). The nerve then continues posteriorly as the tympanic segment (d). The section passes through the vestibule, horizontal semicircular canal, and posterior semicircular canal. 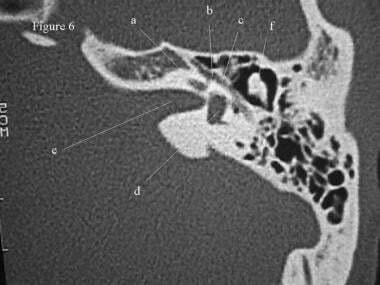 In addition, the image better depicts the head of the malleus (e) and the incus (f). CT scan, temporal bone. The basal turn of the cochlea (a) is demonstrated. The geniculate ganglion (b) and tympanic branch of the facial nerve (c) also are well visualized. The vestibule (d), internal auditory canal (e), and ossicles (f) are visible. CT scan, temporal bone. The pyramidal eminence (a), which gives rise to the stapedius tendon, is shown. The space between the medial wall of the tympanum and the pyramidal eminence is the sinus tympani. The external auditory canal (b) and the tympanic membrane (c) are located laterally. The tensor tympani, which runs along the eustachian tube and attaches to the neck of the malleus, is visible anteriorly (d). Finally, the round window niche is observed (e). CT scan, temporal bone. Continuing inferiorly, the superior aspect of the jugular bulb (a) is demonstrated. The carotid artery is located more anteriorly (b). Immediately anterolateral to the course of the carotid is the eustachian tube (c). The tensor tympani muscle shares a wall of the eustachian tube (d). CT scan, temporal bone. Some of the inferior-most structures in the temporal bone. The glenoid fossa (a) is observed anteriorly. The carotid artery (b) courses medially and anteriorly. The sigmoid sinuses flow into the jugular vein (c). Anteromedial to the carotid, the sphenoid sinus is observed (d). The images below are coronal sections of the same left temporal bone studied in the axial sections. They are ordered from anteriorly (the first image) to posteriorly (the fifth image). CT scan, temporal bone. 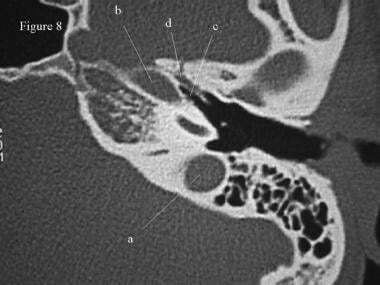 Coronal section through the anterior temporal bone demonstrates the carotid artery (a) near the basal turn of the cochlea (b). The head of the malleus (c) lies in the epitympanum. The mastoid air cells can be observed superiorly and laterally to the superior margin of the glenoid fossa (d), and the supralabyrinthine air cells (e) can be observed superior to the otic capsule. The middle ear space is separated from the middle cranial fossa (f) by the tegmen tympani (g). To help orientation, note the condyle of the mandible inferior to the glenoid fossa (d). CT scan, temporal bone. The carotid artery (a) and the cochlea (b) are shown. The labyrinthine (c) and tympanic (d) portions of the facial nerve are visible. The middle ear space extends quite inferiorly, creating the hypotympanum (e). This section passes through the ossicles in the epitympanum. CT scan, temporal bone. This section demonstrates the internal auditory canal (a), the tensor tympani muscle (b), and the tympanic portion of the facial nerve (c). The first image below provides a view of the facial nerve (a) coursing just inferior to the lateral semicircular canal (b). 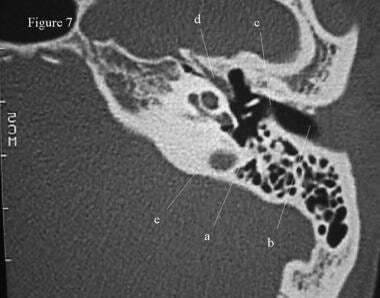 Another key point in otologic surgery for chronic ear disease is to examine the bone of the lateral canal. Cholesteatoma may erode this bone, increasing the patients' risk of a postoperative fistula. In addition, if the bone of the semicircular canal is eroded, be careful in exposing the facial nerve because the bone over the nerve may be dehiscent as well. CT scan, temporal bone. The facial nerve (a) courses just inferior to the lateral semicircular canal (b). The apex of the superior semicircular canal (c) is observed. Laterally, the ossicles are visible (d). The lateral boundary of the epitympanum is the scutum (e), which is a clinically important landmark because erosion of the scutum is often observed in patients with cholesteatoma. CT scan, temporal bone. This section passes through the posterior semicircular canal (a). The tegmen tympani is well outlined (b). A short segment of the vestibular aqueduct is visible (c). Recently, angiographic techniques have been combined with CT imaging to create CT angiography. The resulting images show vascular structures in the context of soft tissue and bony structures. In the temporal bone this is particularly useful for imaging the carotid artery, sigmoid sinus, and internal jugular vein as they course through and along the otic capsule. These images are particularly useful in the diagnosis of venous sinus thrombosis. How prevalent are temporal bone variations on CT scans? Which areas around the temporal bone have the highest prevalence of pneumatization on CT scans? 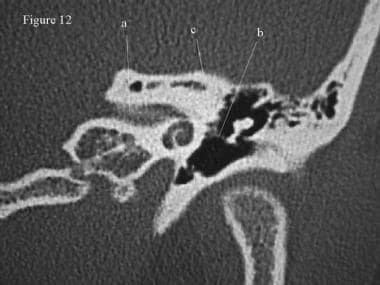 What is the anatomy of the middle ear relevant to CT scanning of the temporal bone? 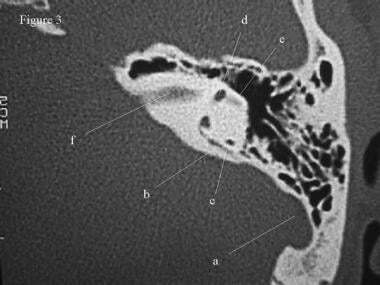 What is the anatomy of the inner ear relative to CT scanning of the temporal bone? 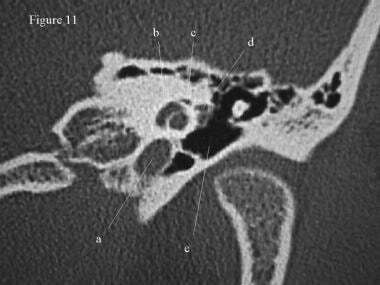 Which findings of dehiscence on CT scans of the temporal bone have been reported? 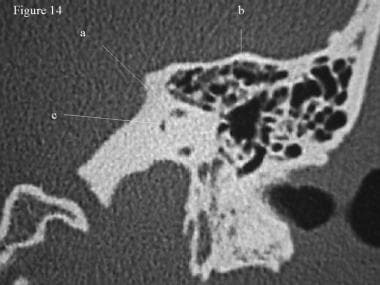 What is the appearance of the temporal bone on axial CT scans? 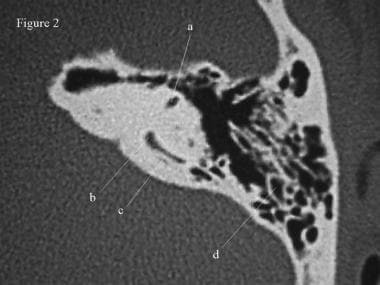 What is the appearance of the temporal bone on coronal CT scans? What is the appearance of the temporal bone on CT angiography? What are the benefits of flat-panel detectors in CT scans of the temporal bone? What are the benefits of CT/MRI-scan fusion scanning of the temporal bone? Fujii N, Inui Y, Katada K. Temporal bone anatomy: correlation of multiplanar reconstruction sections and three-dimensional computed tomography images. Jpn J Radiol. 2010 Nov. 28(9):637-48. [Medline]. Schwab SA, Eberle S, Adamietz B, Kuefner MA, Kramer M, Uder M, et al. Comparison of 128-Section Single-Shot Technique with Conventional Spiral Multisection CT for Imaging of the Temporal Bone. AJNR Am J Neuroradiol. 2011 Jun 2. [Medline]. Visvanathan V, Morrissey MS. Anatomical variations of the temporal bone on high-resolution computed tomography imaging: how common are they?. J Laryngol Otol. 2015 Jul. 129 (7):634-7. [Medline]. Shamshad MP, Kamath G, Babshet M, Srikanth HS, Doddamani L. Prevalence of temporal bone pneumatization in relation to temporomandibular joint - A computed tomographic study. J Stomatol Oral Maxillofac Surg. 2017 Nov 29. [Medline]. Takahashi K, Morita Y, Ohshima S, Izumi S, Kubota Y, Horii A. Bone Density Development of the Temporal Bone Assessed by Computed Tomography. Otol Neurotol. 2017 Dec. 38 (10):1445-9. [Medline]. Saxby AJ, Gowdy C, Fandino M, et al. Radiological prevalence of superior and posterior semicircular canal dehiscence in children. Int J Pediatr Otorhinolaryngol. 2015 Mar. 79(3):411-8. [Medline]. Tada A, Sato S, Masaoka Y, Kanazawa S. Imaging of the temporal bone in children using low-dose 320-row area detector computed tomography. J Med Imaging Radiat Oncol. 2017 Aug. 61 (4):489-93. [Medline]. Rogha M, Hashemi SM, Mokhtarinejad F, et al. 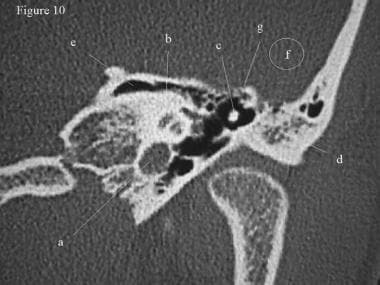 Comparison of Preoperative Temporal Bone CT with Intraoperative Findings in Patients with Cholesteatoma. Iran J Otorhinolaryngol. 2014 Jan. 26(74):7-12. [Medline]. [Full Text]. Majdani O, Thews K, Bartling S, Leinung M, Dalchow C, Labadie R, et al. Temporal bone imaging: comparison of flat panel volume CT and multisection CT. AJNR Am J Neuroradiol. 2009 Aug. 30(7):1419-24. [Medline]. Locketz GD, Li PM, Fischbein NJ, Holdsworth SJ, Blevins NH. 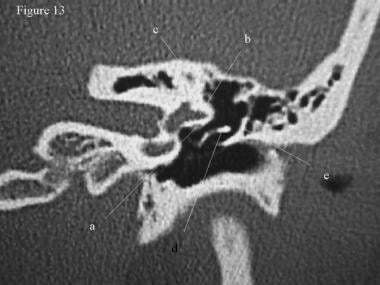 Fusion of Computed Tomography and PROPELLER Diffusion-Weighted Magnetic Resonance Imaging for the Detection and Localization of Middle Ear Cholesteatoma. JAMA Otolaryngol Head Neck Surg. 2016 Oct 1. 142 (10):947-953. [Medline]. Campos A, Mata F, Reboll R, Peris ML, Basterra J. Computed tomography and magnetic resonance fusion imaging in cholesteatoma preoperative assessment. Eur Arch Otorhinolaryngol. 2016 Dec 5. [Medline]. Sagittal sinus, bilateral transverse sinuses, and left sigmoid sinus are seen. The right sigmoid sinus is thrombosed and does not fill with contrast. These vascular structures are presented against the background of a 3-D reconstruction of the brain and meninges. Axial CT scan of the temporal bone depicting the round window niche (a).